French décor’s presence in the bedroom is one of romance, luxury, large furniture and color. Be sure to draw some inspiration from nature and its likely you’ve achieved perfection. French décor allows you to introduce many features into your bedroom in bold ways that most other types of décor generally don’t. The trick is to not go overboard. My advice is to start your project by selecting your color scheme. French décor uses a broad range of colors, including various shades of reds, blues, yellows and greens. Use one or two colors (at the most) for your primary colors and compliment them with a white or an off white as an accent color. Traditionally, French décor calls for lighter or neutral colors as the primary wall color. However, today it is very much in fashion to use darker colors. A shade of blue, such as blue toile, is a decent color for a French inspired bedroom because blue is a relaxing color which will bring serenity to your bedroom. You can also use a golden yellow or burgundy as your main wall color. Once you have chosen your color theme, you should decide on the type of furniture, its size and placement that you wish to place in your room. Remember that large, bold furniture is part of what makes French décor so luxurious. Choose a large bed with big headboard that will be used as the centerpiece of the bedroom. While the rest of the furniture should also be large, there should not be too many pieces in the room. A chest of drawers or an armoire is a good choice. If your bedroom is big enough, you can add a rich loveseat as well. The material that is used for the bed, as well as the rest of the furniture, should be wood. The wood that is used in French décor is either going to be of a dark color or painted in an off white color. The wood should have some sort of carving added to it. At times, you may also find some gold color metal in addition to the carvings. You can complement the dark wood with a dark wall color or white wood with a light color. Feel free to hand paint some flowers or sceneries on the chest drawers to bring some additional color and romance to the bedroom. Mirrors are a good way to continue the tradition of going large in French Décor. Use a large mirror to make the room appear bigger. When it comes to curtains, yours should reach from the ceiling to the floor and be made from a rich, thick fabric. Tie the curtains back to let light in and create a more dramatic effect. The color of the drapes should match your bedding and your furniture in order to maintain the color theme. Add a couple of paintings to the bedroom. Rococo or Baroque themes work best with French décor. Ideal images include those that emphasize nature or people having a nice time. 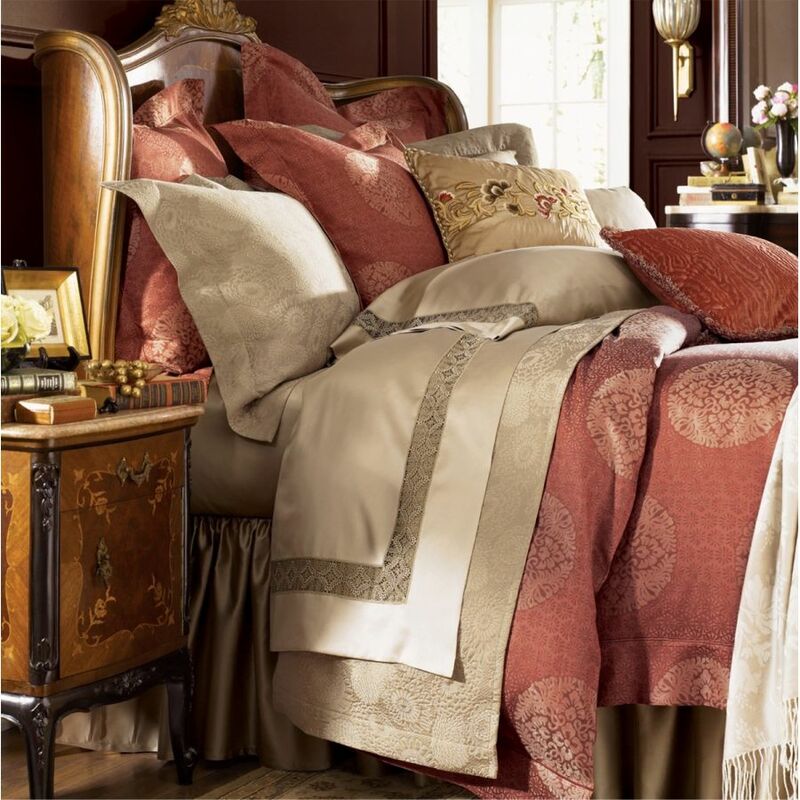 The final touch to your French inspired bedroom is going to be dazzling bedding. 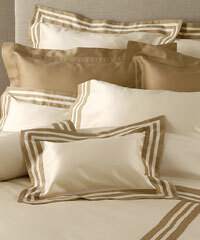 Your bedding should have some shine and luster to it to create a dramatic and welcoming effect. Use white or cream colored sheets to set off a beautiful duvet. 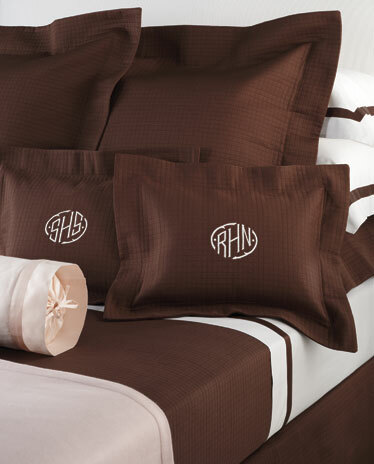 Gold, sky blue, white, burgundy and gold are popular colors to construct themes in French décor bedding. Use a lot of big pillows and neck rolls to complete the effect. While French décor permits you an abundance of freedom to experiment using many variables such as color, texture and patterns in your bedroom, it is very important to not get carried away and be too excessive in your décor. This can make the room appear cluttered and overdone. Have fun decorating and enjoy your new French themed bedroom! R. Jabbour & Sons first opened its doors in New York City over 80 years ago. Passed through four generations of family, R. Jabbour & Sons continues to be a trusted and highly knowledgeable resource for the finest bed, bath, and table linens. Its loyal following of customers rely on the utmost attention to detail and service.